Minarets rise above the Blue Mosque in Istanbul. Istanbul boasts an incredible history with a recent archeological find dating back to around 6700 BC. It’s most notable history probably began with Constantine’s successful capture of the city from the Byzantines, renaming it Constantinopolis, making it the eastern capital of the Roman Empire. However, there was a dramatic shift when Sultan Mehmed II spent 53 days securing the city for the Ottomans and dramatically changed Constantinople into a Muslim city. It has remained so for more than 600 years. I confess to a general ignorance about Istanbul prior to my trip, like I did not know it is literally where west becomes east and east becomes west. Europe ends at the Bosphorus, a water passage that divides Istanbul. Asia begins just a short distance on the other side. I knew Istanbul was a cosmopolitan city where orthodox Islam gives way to a more secularized religion. 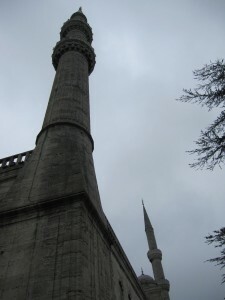 There are many devout Muslims in Istanbul, but there is a disproportionately larger number who seem to greet the call to prayer with staggering indifference. However, orthodoxy seems on the rise with the increased migration of people from the more conservative interior of the country. The ruling party is conservative – every member of the ruling party has wives who cover according to Islamic law – reflecting the majority opinion of Turkey’s population outside of Istanbul. 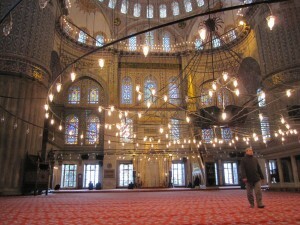 No trip to Turkey would be complete without a reverential visit to the Blue Mosque. My colleague and I shook off a rug salesman and wandered in around 11:30, shortly before noon prayers (which didn’t begin until 12:30). We sat respectfully observing the smattering of adherents arriving early. I found it interesting that I couldn’t find a bathing area which is certainly part of the purification process for Muslims. (It may have been there, I just never saw it). Also interesting that Muslim woman can visit the mosque as visitors but are unwelcome for prayers. If one makes it to the Blue Mosque it is a couple hundred yards to the Aya Sofia, a Byzantine cathedral turned into a mosque after the Ottomans conquered the area. The amazing thing to consider is how tall that dome is and how old the building is (originally build in 360 AD). Both of these locations are just a stop or two from the Grand Bazaar, opened in the 1400 as a way for the Sultan to stimulate the economy after war scattered the masses and there was great need to reestablish the city. 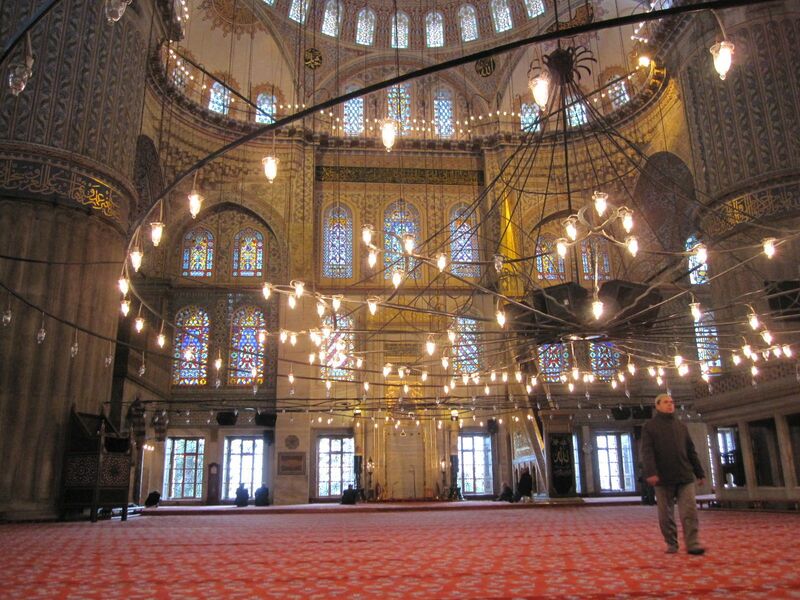 Istanbul is worth a visit, just be prepared for a 5 AM wake-up call from the Imam at the local mosque. I think it’s an absolute stitch to jump a ferry to Europe, then jump on another and head back to Asia … but then I need a life! Was kind of strange, and what was as interesting is the way the people saw themselves. They definitely see themselves as Asians on the Asian side.